MillionaireMatch is for millionaires and those seeking them. As well as those that just prefer a higher quality of potential partner. Active for nearly two decades, it is one of the longest-established sites of its kind - and boasts a long list of successful matches that resulted in happily-ever-after for many couples. The sign up process is fairly painless. It takes about 3 minutes to complete plus however long it takes to think about what to put in the “about me” and “about my match” sections. Luckily these sections can be added later if you're in a hurry to start looking around. Despite the site's name, you can still sign up when you make less than a million dollars. The exact categories are under $200,000, right up to $100 Million+. While it's optional to verify, nobody is forced to so that it is mostly taken on trust. Other than members that specifically choose to, no one has to have their income verified. If you are seeking a millionaire you can specify in what range you expect their potential income or wealth to be. Keep in mind that the higher earners are also extremely popular. Other than members that specifically choose to, no one has to have their income verified. Like most dating sites, what you list as your income is on the honor system. Like other sites in this niche, they benefit from a significant female following. You can signup either the regular way, through the website or if you prefer mobile, with their app. MillionnaireMatch has a highly active community, with most located in the US, UK, Australia and Canada - though many other countries are well represented too. The majority of profiles show that the members have at least something of interest to say, and it is rare to find one without a photo. Like other sites in this niche, they benefit from a significant female following; in fact, active female members outnumber men by around 2 to 1. While this may be good news for the men, women may find they have to work that little bit harder to get the attention of their chosen man. With gold membership comes the option to become a certified millionaire by verifying your income with the site, via tax return copy or bank statement. This earns you a blue gem that will show up next to your name for others to see. Photo verification is compulsory for certified members, who must display an approved face photo on their profile page. Looking for members with verified credentials will avoid disappointment. Once you've upgraded you can search specifically for other members that are verified. Verified individuals are listed in the regular search results as well, but it just takes a bit more searching to find those gems. Other verifications, all offered free with membership, include photo, age, education, and occupation if you would like a badge on the site verifying that you are indeed as awesome as you claim. With Standard (free) membership you can browse other profiles, upload a limited number of pictures (10), send winks to other users, receive and reply to messages sent from paid users, participate in the forum and blog, and observe in the chat room. It's enough to try things out and participate a little, and decide whether the $70.00 a month fee is worth becoming a paid member. With paid membership comes the 5-star treatment, including your own personal account manager. Full membership comes with more options, more privacy settings, more control, and more freedom to move about the site and initiate contact with others. With paid membership comes the 5-star treatment, including your own personal account manager. Paid members can make contact with anyone on the site, can participate in the chat room (while the free members can only sit and watch), appear at the top of search results, and can utilize a variety of search features not available to others. These include eliminating profiles without photos, using the zip code locator, and setting preferences such as appearance and relationship status. It also lets you see how responsive people are. This way you don't waste time messaging people who're unlikely to reply. Completing the relationship/lifestyle questionnaire is strongly recommended. People routinely skip over blank profiles. To make matters worse, empty profiles are unsurprisingly buried deep at the bottom of search pages where nobody is likely to look. There is an extensive list of questions to fill out. These are meant to give in-depth answers so that when people read your profile, they will have a good grasp of who you are. It will ensure your profile appears correctly in searches and compatibility matching, but more importantly it will improve the chances of your profile being quickly approved, rather than thrown into the trash bin by the site's moderators. The site features are available through the website as well as by way of Android and iPhone apps. If your signal is strong enough you might even be able to access MillionaireMatch from that yacht. The site doesn't offer the extensive compatibility assessments that you may have encountered on other sites such as eHarmony. Instead, compatibility is based upon the questionnaire you fill out when first signing up for the site. Areas include preferences and features such as astrological sign, body type, physical appearance, ethnicity, lifestyle, type of relationship sought, and if the member has or wants children. While paid members can review their “compatible matches”, those with free access cannot and will be diverted to the upgrade page should they attempt to do so. The reverse match, another premium feature, shows you who is on the lookout for someone with exactly your qualities. 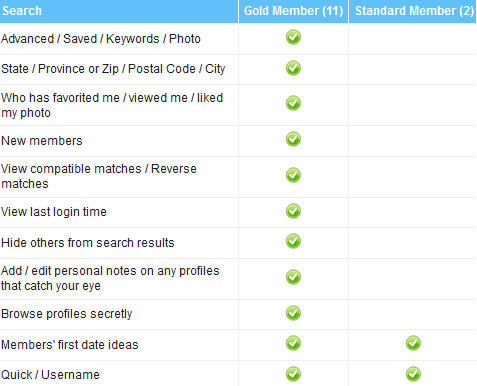 The basic search option available to free members allows you to look by age, general location, and gender. For those willing to shell out the dollars there are several more options to choose from including income level, height, ethnicity, body type, relationship status, and religion. The search can be further honed by choosing a potential match's distance from your location, keywords of your choosing, if they are willing to relocate, and the type of relationship they are looking for. Free members cannot initiate conversation but can still respond if someone approaches them first. As a free member you cannot initiate conversation, but can still respond if someone approaches you first. There are additional sections such as the site photo gallery that members may add to, and a Q and A section in which a counselor offers advice for member's questions. You can even search through a database of thousands of first date ideas submitted by members. Members' Luxuries is a new area that lets people display photos of their treasured items for others to see. MillionaireMatch is a popular site that's established a niche serving the wealthy, the aspiring wealthy, and those who would like to meet them. I personally haven't been swept off my feet by any millionaires while on there, but for someone with a dedication and a sense of humor it's a venue where that miracle could happen. Community: Millionaire Match is the largest site of its kind, with an active community of real people. With a decent photo-profile most members should expect good response rates. The majority of people that I emailed did reply. Admittedly in a few cases it was a polite, “thanks, but you're not my type” kind of message. Reputation: The site has a solid track record, and consistently features at the top of many recommended “wealth dating site” lists. Their billing and cancellation policy is clear and does not in any way mislead their subscribers. Free accounts: Free account holders are able to access many activities on the site, including reading and replying to emails which means some participation is possible before deciding whether to upgrade. Features: A good range of features and tools are available; your home page provides a running history of people who you've contacted, who's viewed your profile and who's requested to see your photo. You also have full-control over account and privacy settings. Online and telephone support: The site's help and support is there 24x7 should you need it. Not everyone is certified: Unless you are willing to pay the subscription fee, finding those certified members can be like searching for a needle-in-a-haystack - in most cases information stated on profiles needs to be taken at face-value. Site navigation: Browsing the site can be slow at times. Mouse clicks tend to open new browser windows. High ratio of women: Though this is clearly a plus point for men on the site, it does mean that those “high-value” men receive a lot of attention from the ladies. Rss Feeds. Subscribe to comments for this site. [?] Receive updates about Millionairematch.com directly through your newsreader. if you are in need to find the perfect rich man that wants to lavish you and respect you, spoil you and or find real love or just pampering then you just need to catch it. I am interested in the Free Basic Membership for starters. Millionaire match is like a desert. I dare you to meet someone on this site. It's full of pretend losers! and the company is fradulent and falsely advertises refunds if you're not satisfied with this deserted site. Try getting that refund! What's more is that the few ppl on the site are either from the land of far, far away or simply not worthy of a reply! This one seems to be more popular and it does has some potential but it is lacking in customer service. Responses are slow no matter how high of a level you have on the site. I my opinion this can be dangerous for actual millionaires, what if somebody is just looking for people that are loaded and make a lot of money to steal from them, I guess the idea is good but actual millionaires meet other millionaires at private parties in some millionaire city. I like the fact that you can still use some of the features in the free account cause then you can try before you buy. And having support 24x7 is a big pro. I used a dating site that is similar to this and did not like it but a friend of mine told me millionairematch works better. MillionaireMatch 3.44 50 A review of MillionaireMatch. MillionaireMatch is for millionaires and those seeking them. As well as those that just prefer a higher quality of potential partner.